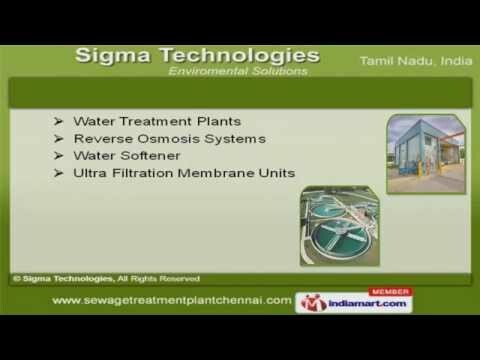 Welcome to Sigma TechnologiesManufacturer & Supplier of Water Treatment Plants The Company was established at Chennai. international quality standards & EfficientR&D department make us unique in the industry. Almonard, Bharat Petroleum & Kusalava are some of our esteemed clients and we arebacked by complete client satisfaction & customized solutions. We offer a vast range of Waste Water, Sewage & Effluent Treatment Plants. Reverse Osmosis Systems & Water Softener offered by us are in huge demand acrossthe global markets. Our UV Treatment Systems & RO Industrial Plants are available at industry leadingprices. We also provide Water Softening & De-Salination Plants that are widely appreciated inthe market. Along with that we offer Water Filtration Plants & Ultraviolet Water Filters that are bestin the industry. Our Operation & Maintenance AMC are well known for their outstanding performace.